Many students asking how to improve my English grammar and writing & how to better your writing; but for students, it seems easy to buy research paper online compared to learning writing skills and doing the paper yourself. Although this is a common trend, every student needs to know English writing skills & how to write well. They need to write a complete essay without any traces of grammatical mistakes. Particularly, for bloggers, no matter how good you're at Internet marketing, the quality written content will help you to get higher search ranking compared with the thousands of low-quality blog pages. Blog writing is a very important element while starting a new blog. Some users use it as a hobby, while others manage it to make money on it. Giving your content a little boost in writing isn’t too hard if you follow some important tips. Learn to write well in english; here sharing best way to improve English writing and are the top nine tips that will boost your writing skills in 5 minutes. Some valuable and essential tips for bloggers to bypass grammar mistakes and how to improve writing skills that escape content mediocrity. Developing your blog writing skills not only encourages you in blogging but also makes you unique & apart from others by growing your good communication skills. 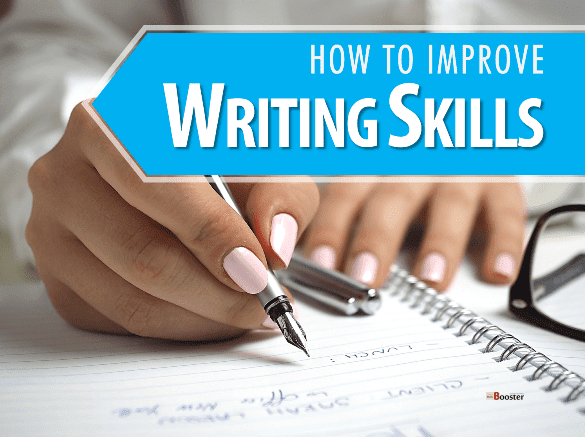 Check out activities to improve writing skills & how to better your writing in quick ways. Creating a quality blog post is one of the Best Blogging Skills Needed To Be A SUCCESSFUL BLOGGER; seen on the previous post and today I am going to discuss most effective ways to develop and improve your professional writing skills quickly. 1. Use of shorter sentences. When you write longer sentences, it becomes hard for the reader to follow. So, before you publish or submit your blog post/paper/essay, go through your work and pinpoint long sentences and shorten them up. Start by breaking the sentences into shorter once by using a period or comma where necessary. Some sentences may sound good even when they are long, but these are exceptions, not the norm. Make sure you stick to shorter sentences to give the content a good flow. Active voice increases readability. In fact, the most basic sentence structure in English is Subject-Verb-Object. So, follow the same format. 3. Simplify the complex points. If your points are complicated or difficult in some way, it becomes hard to remember. Instead, reduce them into simple, memorable phrases that can stick. Remember that your readers consume volumes of information that they are exposed to every day including those who look seek “write my paper for me cheap” services. So, simplify the task for them by highlighting your points in a maxim (a short statement that expresses a general truth) to avoid forgetting what they wrote. You won’t get points for saying 50 complex words what could have been simplified into 20 simple words. A good piece of writing is precise and spiced up with the unexpected. Choosing the right verbs and adjectives can turn a boring sentence into a memorable quote for many years to come. When you want to write a blog post or any type of writing, look for words that are as specific as possible. It is very unprofessional to keep repeating the same word over and over unless you want to build a rhythm. The only exception to this rule is where you intend to describe a dialogue. A poor writing is filled with words like “he said” and “she commented.” Instead, you may opt to use a simple “said” to avoid much repetition. But remember, don’t play with the words too much as this may make it harder for the reader to get back on the flow. By strong words, I don’t mean complicated. Rather, you can use a simple word like “use” instead of “utilize.” Whichever the case, if you have a chance to use a better but simple word, go for it. 5. Support what you say. Don’t state ordinary ideas without providing evidence. Don’t just say something without a proper argument to support your answer. Furthermore, what evidence do you have that it’s true? State and explain the meaning behind your statement to allow the readers understand what you’re talking about. It will also support them decide whether to agree with you or not. Clichés are ideas or phrases that have been used quite often to the point that they’ve lost the impact they once had. When writing either fiction or nonfiction story, cut down on the use of clichés to make it better. It is also important to avoid clichés when writing about yourself. If you have to describe yourself, say that you are able to communicate well with different people because you lived in seven different countries while growing up. This will send a clear message to your readers that you are a “people person” without using a lazy language. 7. Be cautious when using metaphors and similes. A good metaphor or simile is a good approach to give your writing that punchy and intense experience. However, poor use of these two can make your writing weak and meaningless. Similarly, overuse of metaphors and similes may be a reason enough to show that you aren’t confident with what you’re writing and you just rely on the figures of speech to clarify your thoughts and ideas. Just like clichés, they can be disregarded really quickly. If you need to use a metaphor or simile and you’re not sure how it is used, look it up. If not, skip it altogether and move to something else. Whether you’re writing a college essay, a short story, an admission essay, or a dissertation, it is important to be more precise and specific. Avoid generalizations and strive towards writing universal statements to improve your writing. The same rule applies to creative writing. Don’t be compelled to assume anything until you examine it fully. Non-examined thinking prevents you from being creative, and there is little chance of exploring some of the possibilities in real life. 9. Proofread and edit your writing. Editing is an essential part of writing. You have been writing that essay for weeks, and you’re confident with what you have written. Now it’s time to proofread and edit your content thoroughly. You don’t want to write a good essay only to find that it is jumbled with grammar and spelling mistakes. Before editing, let it sit for a day so that you can relax first, then read it over when your mind is fresh. When you’re done, give it to another reader to confirm that it is perfect. Your work will be much stronger and easier to read after editing. Writing is daunting. But, the best way to be better is to practice every day. Remember that the first draft is never perfect even for professional writers. Be prepared to write several versions before you develop the skill. With time, you will master the skill, and you can write anything well. Let me know what do you think overall this, and don't forget to share your ideas to develop and improve writing skills quickly. You can use the comment section shown below to share your thoughts. I would like to read and communicate with you.